Japan - At a car factory in this city named after Toyota, the usual robots with their swinging arms are missing. Instead, workers intently fit parts into place by hand with craftsmanship-like care. The big moment on the assembly line comes when two bulbous yellow tanks of hydrogen are rolled over and delicately fitted into each car's underside. While much of the world is going gung-ho for electric vehicles to help get rid of auto emissions and end reliance on fossil fuels, Japan's top automaker Toyota is banking on hydrogen. Toyota sells about 10-million vehicles a year around the world. It has sold only about 4000 Mirai fuel cell vehicles since late 2014, roughly half of them outside Japan. The Mirai, which means "future," is not cheap at $57 500 and Toyota loses money on each one. Still, the company's goal is to sell 30 000 fuel-cell vehicles a year by about 2020. Hydrogen fuel cells don't suffer the EVs' main drawback of limited range. The Tesla Model S can go about 480km on a single charge, although that varies depending on driving conditions, and that's quite a distance for an EV. The Mirai can run for 502km per fueling, under US EPA conditions, and fuels as quickly as a regular car. He said: "Hydrogen doesn't exist in the natural world on its own, but you can create hydrogen from various materials." Detroit-based General Motors, Mercedes-Benz of Germany, Japan's Honda Motor Co. and Hyundai of South Korea have also developed fuel cell vehicles that are on the roads in extremely limited numbers. The Hydrogen Council, made up of 28 companies that are promoting hydrogen fuel, said in a report this week that it expects hydrogen to power about 10 to 15 million cars and 500 000 trucks by 2030. It also forecasts it will be widely used for industries, heating and power and power storage. The group met this week in Bonn, on the sidelines of the COP23 UN meeting on the environment. 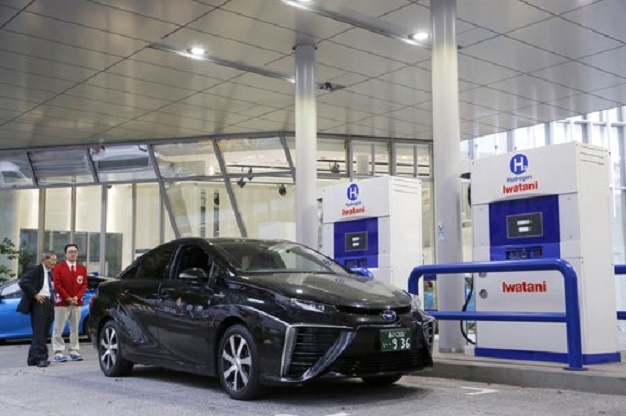 Toyota and other manufacturers pursuing hydrogen fuel cells face some significant hurdles. Japan has an ample 28,000 EV charging stations but only 92 hydrogen fueling stations, and they are costly to build. Hydrogen is viewed as potentially hazardous: the 1937 Hindenberg disaster, when 36 people died when the hydrogen-fueled airship caught fire and crashed, ended an earlier era of hydrogen-powered passenger travel. Hydrogen explosions during the 2011 nuclear catastrophe in Fukushima are a more recent example of such hazards. But proponents of the fuel say hydrogen is no more dangerous than gas or electricity if handled properly. A fill-up with hydrogen takes about as long as at a gas pump, while EV charging takes about 30 minutes using special equipment for quick charging. Regular charging can take hours. "I'm not claiming that hydrogen will replace any form of energy, but it will find its place in the world energy mix," Benoit Potier, chief executive of French industrial gas company Air Liquide, and a chair of the Hydrogen Council, said in a telephone interview. Air Liquide has been working on producing, storing and distributing hydrogen fuel for more than four decades. Potier says he expects costs for making the gas will fall as its use becomes more widespread. In one step toward widening use of hydrogen, Kawasaki Heavy Industries, an aerospace, motorcycle and ship manufacturer, is developing a technology to make hydrogen in Australia using "brown coal," peat or low-grade coal for shipment to Japan in tankers it plans to make. Not all Japanese automakers are sold on the idea. Manabu Satou, general manager of technology at Toyota's rival Nissan Motor Co., finds it an "utter mystery" why anyone would be so set on fuel cells when China, the world's biggest car market, is going for conventional EVs. "If we are talking about a form of great energy like hydrogen, then why not just go all the way to a nuclear car?" said Satou, whose company leads in EV sales with its popular Leaf compact. Ryuichi Kino, who has written about electric vehicles and energy, views fuel cell vehicles as an excessively expensive, futuristic technology. "If it focuses too much on fuel cells, Japan is going to end up super-ultra-Galapagos," he said, alluding to the secluded Pacific islands that are home to unique species that don't exist elsewhere. For most automakers, fuel cells are an area just for research, while EVs already are commercialized, Kino said. But he allows that a technological breakthrough could bring a hydrogen-based sea change in the global race toward automotive "electrification." "Winners could become losers, and losers could become winners. It's still anyone's game," Kino said.